But what we did get at this grandest of challenges in modern F1 was an imperious win, and a highly timely one for driver and team. Lewis Hamilton and Mercedes bounced all the way back to the top from its wayward Hungary and all that, and in the finest style. No one got near the Mercs today. 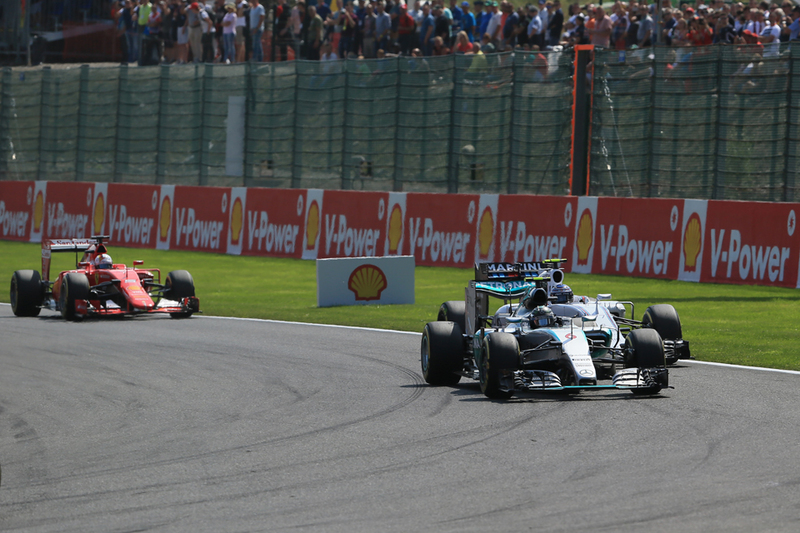 And from the moment Lewis held off the then-nearest pursuer (the indecently-fast Sergio Perez) into Les Combes on the first time around the end result did not look in doubt. So in other words normality was restored here, but in the most abnormal place for such a thing. Lewis was aided too by that his team mate Nico Rosberg was one of the main losers off the line - he later said that his launch "sucked" - in this first start in which the new restrictions of pit wall assistance would apply. The upshot was that he was P5 on lap one. "I completely messed up the start, which was very annoying," said Rosberg. "The start was really bad so I need to practice that a bit more. "We did another formation [lap after Nico Hulkenberg's Force India had trouble on the grid first time around], which puts more temperature in and things change, that also caught me out. But it's my job to do it well and I didn't do it well." It was intriguing too that Lewis commented afterwards that he foresaw the clutch overheating issue from the extra formation lap but that he devised a way to prepare for it. Matters then came to Nico somewhat as after passing Valtteri Bottas first Daniel Ricciardo and then Perez ahead peeled in for early stops. All of this left Nico in second with a clear run at Lewis but even so was eight seconds shy. For a time though it looked as if he might make the race for first interesting as he nibbled continuously at Lewis' advantage as well as took a bite out of it by being able to pit first (so to cover off cars behind) after the opening round of stops. Just after a mid-race virtual safety car period Nico was just 2.2 seconds shy indeed. But at that point Lewis put the hammer down again and in a series of devastating laps re-established his command. It was all over bar the shouting. 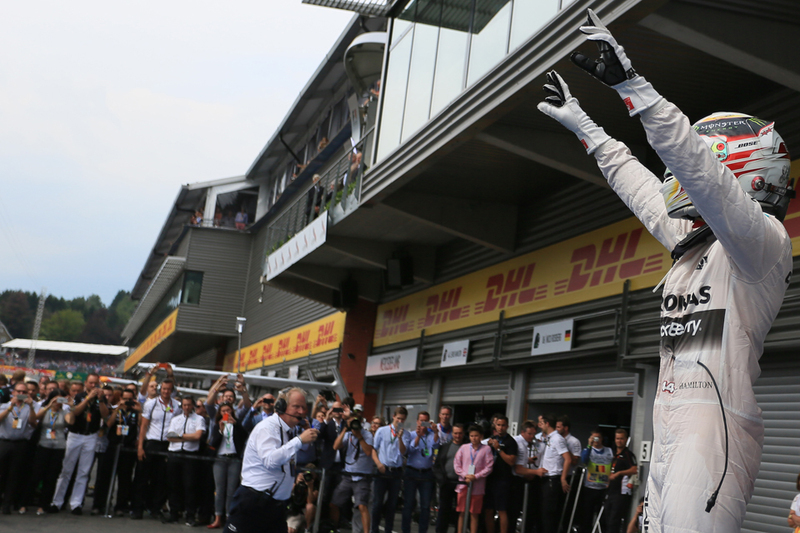 "Lewis did a great job; deserved to win. I did everything I could but obviously not enough" said Nico later, summing up the fight for first. Lewis concurred with inadvertent brutality. "Nico obviously had good pace but I was able to answer most of the time" he said. "I was fairly relaxed at the front so it was largely about looking after the tyres. Particularly at the end when I saw that a tyre had blown on one of the other cars so I was being very cautious." 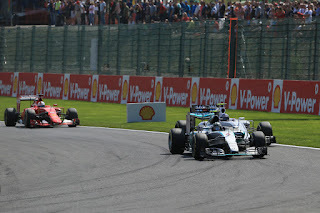 And even that ill-wind blew Merc good this time because as a result of this its nearest challenger Sebastian Vettel came away from Spa with nil points. The Ferrari was curiously off it in qualifying but as he seems to do just about every time this campaign he elevated himself into the highest feasible position in the race, this time to run third trying a one-stopper. He had the amazing Romain Grosjean hunting him down late on for the place but it looked like he could stay just about out of the Lotus's range. 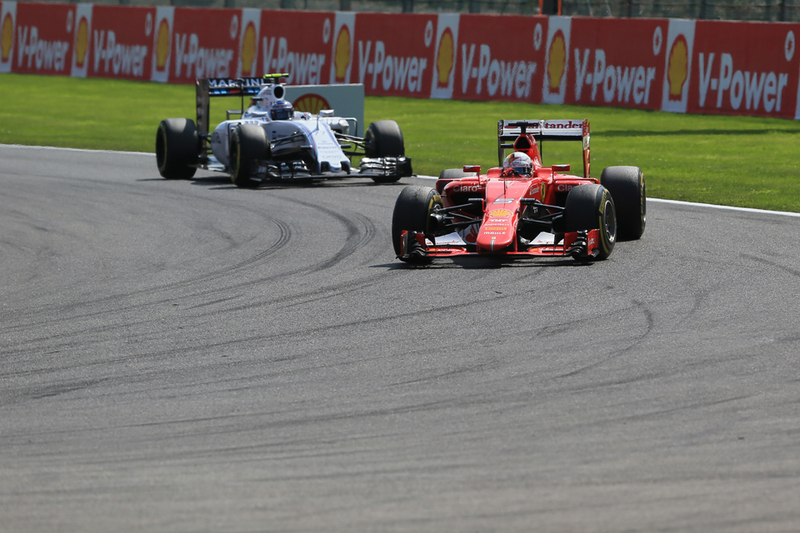 But two laps from the end one of Seb's tyre failed, consigning him to a 12th place finish. This also won't be the last we hear of this failure either, especially as it followed another failure for Rosberg in Friday practice. Seb's words indeed post-race ensure indeed that this one will run a while. As does that Pirelli's first utterances have suggested that it feels the failure was down to Ferrari trying to stretch out a stint too long, even though it was well within the maximum number of laps for wear (trying 29 laps when the limit was 40) given by the same Pirelli. All of a sudden too the prospect, albeit remote, of Seb pinching the drivers' title away from the warring Mercs looks as good as gone. But that's the problem being the one trying to claw back a deficit, is that you can't afford setbacks. 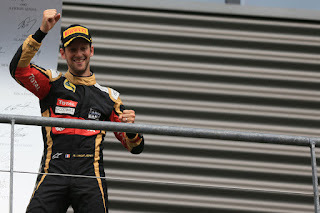 And ah yes, we'll return to the amazing Romain Grosjean. F1 does have a habit of providing the bitter-sweet, and that's indeed what we got here. Such a result would not have looked at all likely prior to qualifying. The Lotus appeared evil to drive while vultures circled of the cars being impounded possibly due to a legal action from its former reserve driver Charles Pic (just the latest of a series of financial woe manifestations for the team). More broadly since the end of 2013 no Lotus had finished higher than seventh. The amiable Grosjean appeared to concur too as he exclaimed 'don't ask me how...' upon entering the podium ante-room. But qualifying confirmed that if the car is lairy it had good lap time and Grosjean got fourth-fastest time, although he couldn't start there thanks to a five-place grid drop from a gearbox change. But come the race Grosjean continued to make good on the pace by coming through the pack and getting into the thick of the mix for best of the rest. He completed the podium and there wasn't a dry eye in the house (apart, perhaps, from Pic's). 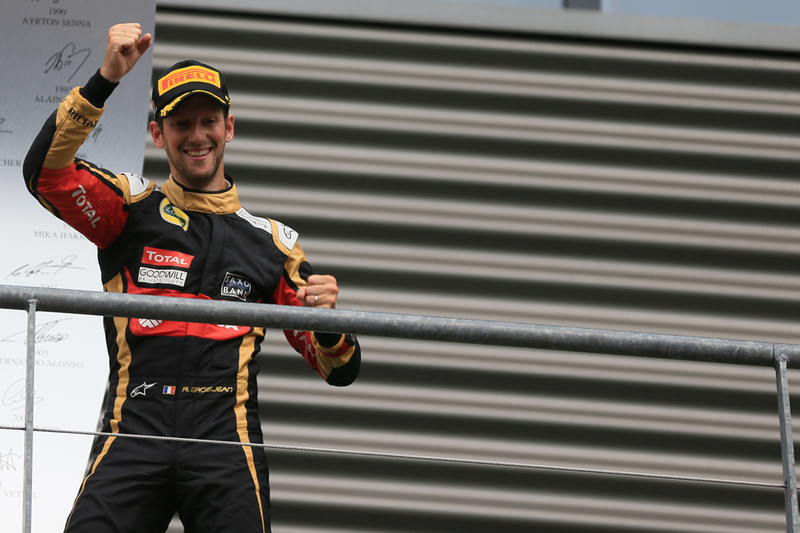 "I was crying on the last lap," Grosjean noted. "It was hard to see the apex on every corner." It was all a timely reminder that there are those who rate Grosjean as good as they come, as well as that since late 2013 when he really impressed us he hasn't become a bad driver because he's been given poor cars to drive since. The latter point seems obvious but you'd be astounded how often F1's decision-makers seem to forget it. Is that Ferrari apparently barely considered Grosjean for 2016, even though he'd come for free, a case in point? "I know what I can do with the car, I know when everything is under control I'm really quick", Grosjean added later when asked about that very matter. And Ricciardo and Perez shouldn't be forgotten either, as they likely would have been right in that same mix for the final podium place without bad luck. Ricciardo was doing a middle stint on medium tyres meaning the race was likely to come back to him only for him to stop midway with engine electronics maladies. And the virtual safety car period that resulted from Ricciardo's parked car rather diddled Checo as he pitted at that moment under 'green' just before the virtual safety car 'appeared', which cost him around ten seconds and a number of places to cars who pitted when the race was forcibly slowed. He nevertheless salvaged fifth. 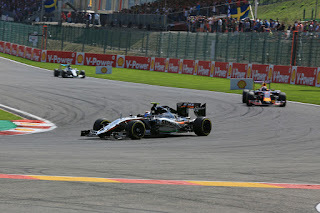 Spa didn't totally go against type as there was a tight exciting multi-car battle behind the Mercs, Seb and RoGro. And Daniil Kvyat continued his exciting flourishing by slicing through them all on fresh soft tyres in the late laps to claim fourth place. Max Verstappen yet again showed that he is rather a potent young gun with another combative race that got him eighth (he oh-so nearly seized seventh with a last lap move on Kimi Raikkonen which he couldn't make stick). One thing of course that looks a lot like sticking more firmly is Lewis Hamilton's 2015 title push. He now has upwards of a race win over Nico on points and to be blunt it's hard even now to see how on current form Nico will ace it often enough in the remaining rounds to pull that back. Vettel we've talked about. Lewis refused to be drawn of the matter of the championship afterwards but surely only a scarcely-credible run of bad luck can deprive him, or failing that a personal implosion. Not that you should count too much on the second of those occurring at least, judging by Lewis's words afterwards: "Last year I had crashed out of this race I was 29 points behind when I came out of here, so it's been way more positive [this time]. My goal coming back after a real great holiday was coming into this part of the season [and]...those great laps that I'm doing in qualifying I need to convert them into race wins. Today was really the start of it hopefully. "You can't imagine how at peace I feel right now." Don't bet against him.